A member of the Front Range Woodturners, Bear Limvere, came in with a multi-axis hollow-form, but he refused to tell me how he had done it. When I see something that someone won’t explain to me, I’m going to figure it out how to do it by myself. I spent 3-4 weeks working different processes on how to turn a multi-axis hollow form. I figured out how to make an offset tenon and made a jam chuck to finish it. 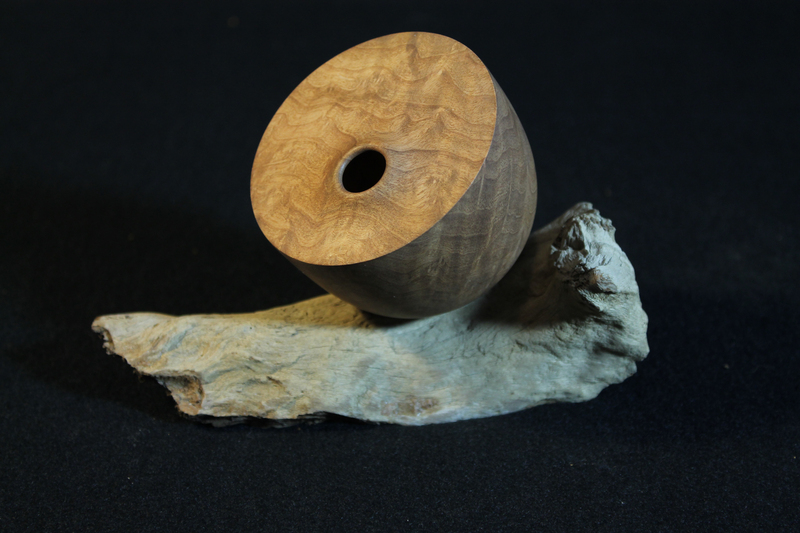 Overall, this took my about six months of trial and error about how to hold a multi-axis piece on a lathe. This piece of wood was really perfect for a round-bottom multi-axis hollow form. Madrone is a gorgeous wood that doesn’t grow in Colorado. I’d been saving that chunk for a couple years, and after practicing on more local woods, I knew I could nail the design that I wanted. The moment I had the confidence, I knew immediately that I could turn that piece. It was a huge confidence builder to be able to envision a design and know that the piece is going to come out the way I wanted it, and to me, it worked out really well. This piece is definitely one of my favorites. What about you? What do you think about this piece? Please feel free to post your comments in the comments section below.